About a week ago, someone decided to allow TwitchTV viewers to simultaneously enjoy a game of Pokemon Red together. Though it originally started as a social experiment, it quickly spiraled into something greater than that. The TwitchPlaysPokemon community became a culture with an immense following. On the subreddit, players discuss strategies on how to get over 70,000 concurrent players to collectively do the same thing in order to complete the game. OK, getting 10 people to do something all together is difficult, but over 70,000 people? Now that’s insanity. Now, before I get too carried away and start running circles around in an elevator, I need to start talking about this recipe. I wanted to create an appetizer that could represent the all-mighty Helix Fossil. Ahh praise the Helix Fossil! This bite-sized treat can be easily enjoyed while you mash your A and B keys in the TTP chat. Prep time for this is roughly 25 minutes. Cook time is roughly 15 minutes. This will make about 20 puffs. 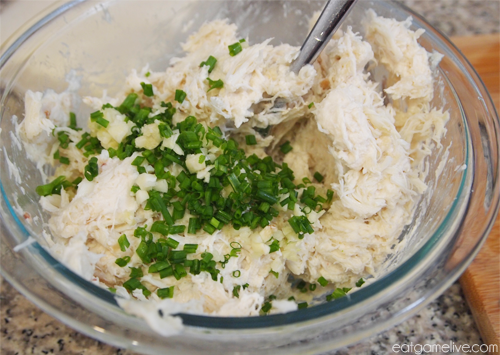 In a bowl, combine your crab, cream cheese, salt, pepper, paprika, worcestershire, mustard, garlic, and chives. Mix until thoroughly combined. Gently cook your spinach by either lightly boiling it until wilted, or microwaving it for about 30 seconds. Add your spinach to your crab mixture and combine thoroughly. Unfold your puff pastry and using a sharp knife or a pizza cutter, cut it vertically into 3 equal sections. Then, cut it into 4 equal sections horizontally. Cut each section in half. You should end up with 24 sections. Reserve 2 of the sections for the Helix Fossil design. 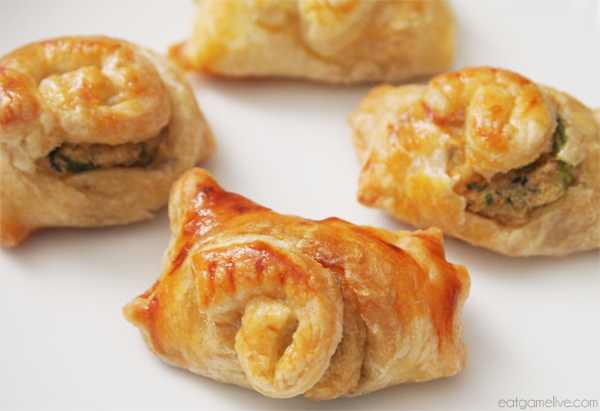 Put about a spoonful of crab in on each pastry section. 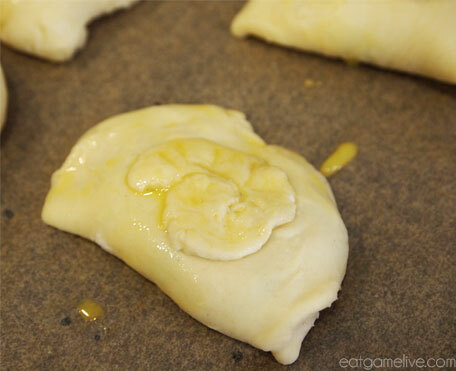 Gently fold the pastry over the crab and crimp the corners. Take an unused section and cut a 1/4inch strip of puff pastry. Roll the puff pastry into the shape of a helix. Use a knife to create the ridges on the shell. Place the helix decoration on top of the puff pastry. Pre-heat your oven to 350° (~176° C). Place your pastries on a piece of parchment paper. 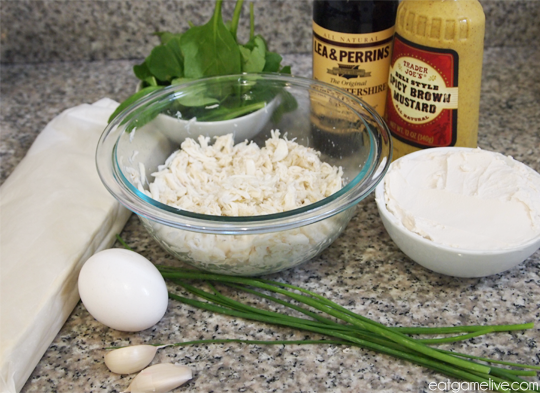 Scramble your egg and add about a tablespoon of water to it. This will be your egg wash. Using your hands or a brush, gently dab some of the egg wash onto your pastries. Place pastry puffs in the oven for 15 minutes or until golden brown. Remove and allow cool for about 5 minutes. Now, as you enjoy these delicious Helix Fossil bites, please don’t forget to take a moment to remember our fallen heroes. CURSE YOU, DOME FOSSIL AND YOUR DOMEOCRACY! This entry was posted in pokemon, seafood by admin. Bookmark the permalink.